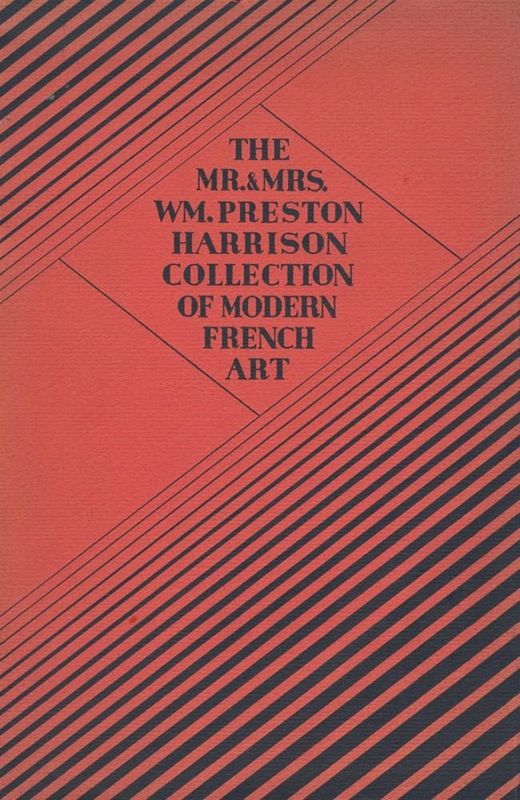 Jan Gordon's introduction to The Mr. and Mrs. William Preston Harrison Gallery of Modern French Art is a rarely seen work, published in 1929. It is listed in a bibliography of Jan Gordon issued during the memorial exhibition following his death in 1944, but is missing from subsequent summaries of his publications, with one exception. "Born in England, has been a resident of Paris for over a quarter of a century. Well-known as a painter and illustrator, he is also a distinguished traveler, lecturer, author, and critic. His book, Modern French Painters (Dodd, Mead and Company publication), is generally recognized as one of the best treatises on Modern Art." On Modern Art, Jan Gordon comments that, "Even today in the States there are few opportunities of studying this recent growth in Art. Few public galleries show Modern pictures..... So with considerable surprise we found in Los Angeles this most unusual gallery. In drawings and watercolors it is the best of its kind in the United States and indeed it comes only second altogether to that in the Art Institute of Chicago which is the princely gift of multi-millionaires." Jan Gordon's explanation of Modern French Art as illustrated by the 86 pictures in the collection includes an arrangement of the painters represented into eleven groups, ending with "Pattern almost entirely reduced to flat abstract composition inspired by natural objects but only hinting in the most distant way at the sources of inspiration", represented by de la Fresnaye, Gleizes, Picasso and Braque. "This collection carries the spectator from almost pure realism to complete abstraction and indeed to things which to the ordinary eye must look like mere impertinence." "There are few visitors, I venture to assert, who will find any sense of beauty in Braque's two little pieces of wall paper or Picasso's hieroglyphic. And yet .... art depends not on the materials employed nor on the skill in imitation but on the mind of the artist. He can work with whatever he chooses. Wallpaper is not per se more degrading than oil paint. Yes, the great artist will make art out of anything even out of nonsense; while the poor artist will expend all the treasures of the art store, will even commandeer a mountain, as has been done in Georgia, and will produce nothing but shoddy." Eighty five years after it was published this text remains a clear explanation of those revolutionary developments in Art of the first decades of the twentieth century. Jan and Cora Gordon: Who was "K"?